I took this picture in my yard a few days ago. Everything in the photo has special meaning – it is my go to spot and what I see out my kitchen window. The hydrangea plant lived by the front door for years and never did a thing, no puffy blooms, no wide green leaves. All those years it was stunted and scrawny and clearly unhappy. When I moved it to the back yard I did what I always do with my plantings, I muttered “you are on your own now.” Clay runs underneath the thin layer of top soil and the woods and wild berries threaten to choke. So, there is no coddling or coaxing from me. The hydrangea has found its place with just the right amount of light, and maybe with roots that pushed through or around the clay. That is a happy shrub and it’s blooms placed in mason jars are sitting on the kitchen counters of several of my friends. The stone bench in the photo is from my parents’ backyard – gifted to me when they moved out of their house. It was my dad’s seating for watching his grand children run through the sprinkler, collect Easter eggs, play soft ball…whatever the activity, he loved to watch and cheer. When we brought the bench to our house we tried to find a corresponding spot, and I think we did. The stone seat warms in the sun and never slumps under all the snow. It is happy there in all seasons and offers an inviting reminder of my dad. The apple tree is my husband’s and youngest son’s creation from the seed of an apple. Yes, it can be done. First it was a little sprout in a small plastic container and then not much more than a stick in a big pot. Eventually it got its own place in the yard. The first year the blossoms appeared we were so excited until we found out that the daddy of our apple tree was a crab apple. Ever ingenious and creative, my husband set out to graft on as many kinds of apples as he could. Not all of them took, and well, he ran out of time. But, look, at it now, fleshed out with fruit and waving to me at the window. Everyday. Last year I took almost the exact same photo but the lighting was flat. There was no sun shining through the tall trees. I am sure it was there – it just did not cast the same glow. So with a few editing moves on my fun camera phone – I was able to flood the picture with a similar down light. Of course, the sun was out that day, I mean it is always there…. The day was bright but I did not catch the light. It was not in my view. And this time, with this photo, I was there at the right moment and did not need to supply artificial light. 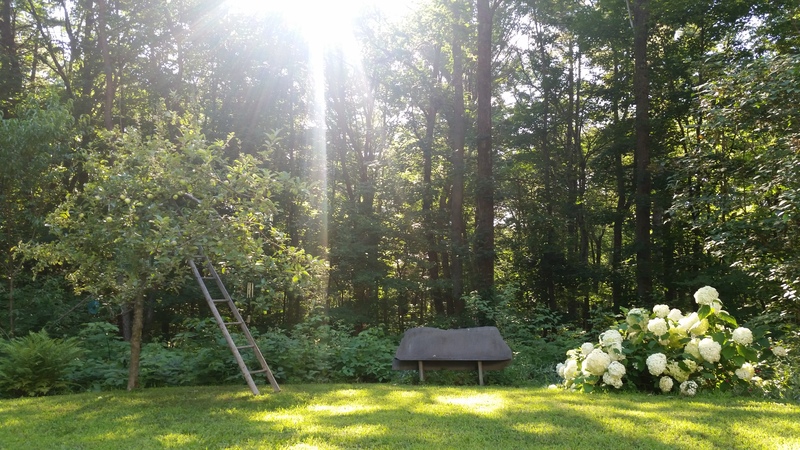 The hydrangea, the bench, the apple tree and myself – we were all just soaking it up. As I grieve for my husband, raise my kids, work at my new job, and live this life of after, I wonder sometimes how to find the light, keep things light, make things bright. Worry, sorrow, and stress can leave me feeling like the hydrangea in the front yard – undernourished and trying to survive. I want to sprout joyous fluffy blooms, I want to be the warm bench, I want my branches to be heavy with fruit. I can, I have, and I will, but it takes energy and thought. The challenge is there – daily. I need to find the right places to see and feel the sun, feed my deep roots, and cut back the things that threaten. I wonder how it is for you and I am open to suggestions….